When it comes to variety, few patterns are quite as reliable as star quilts. They can be classic, contemporary, and are just all-around fun to make. In honor of one of the most popular quilt designs, we've created the "Spectacular Quilt Star Patterns How to Make a Quilt with 8 Star Quilt Block Patterns and Quilted Star Designs" eBook. Inside, you'll find a series of colorful quilted star patterns used to make quilts, block patterns, and a few fantastic home decor items. Create a design with real star power for any part of your home with these unforgettable star quilt patterns. Our readers have had a blast seeing the different ways our bloggers and designers have turned basic star quilt patterns into brand new quilt patterns. 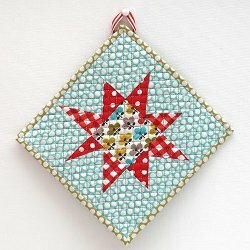 Quilt stars have such a large appeal because they're so easy to adapt. If you want to add some charm to your home, grab some vintage-inspired fabric and you can make a star quilt block into an accent for your home. There are also plenty of ways you can turn your favorite lone star, friendship star, or any other of your favorite star designs into patterns that the whole family will love. If you can't decide what you want to make yet, no problem! This eBook offers small quilt projects and quilt block patterns that you can complete in an evening, as well as a range of bigger star quilts that give you ways to work with the designs you've learned about on a bigger scale. Download Spectacular Quilt Star Patterns: How to Make a Quilt with 8 Star Quilt Block Patterns and Quilted Star Designs for free today! Spectacular Quilt Star Patterns: How to Make a Quilt with 8 Star Quilt Block Patterns and Quilted Star Designs starts off with some quick and easy quilt patterns that we believe will help quilters begin to see how to use their star quilt patterns for projects that can be displayed in the home. 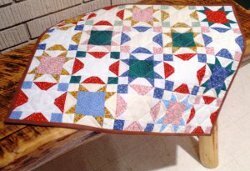 These small quilt projects aren't just for show; there are also lovely little star designs that you can add to your kitchen or dining room for a homemade appeal. There's no better example of how useful your star quilt designs can be than the "Starbright Quilted Potholder" (p. 5). With some cheery fabric, you can put together an absolutely adorable and wonky star quilt block that becomes a handy little pattern. Not only does this pattern function as the sweetest-looking potholder you've ever seen, but it can also be used as a mug rug and coaster for your kitchen, dining room, or any other room that needs a little brightness. You can make this star design using pretty much any color scheme, so it's a must for anyone looking to add some starts to their home decor. We've also got some lovely decorative options like the "Color Power Folded Star" (p. 9), which is an intricate wallhanging quilt pattern that really puts your skills to the test. More advanced quilters will enjoy working on this challenge, especially because this quilted star design won't take you longer than a day to make. You won't need to spend money on pricey art pieces and decorations now that you have these star quilt patterns to show you how to add home decor accents suitable for any space. You may be ready to get to work on your next star quilt pattern, but want to find the right block pattern. Luckily, there's plenty of options in Spectacular Quilt Star Patterns: How to Make a Quilt with 8 Star Quilt Block Patterns and Quilted Star Designs. Our amazing cover image features the "Split Drunkard's Path Star Block" (p. 20), one of the most innovative and magical ways our bloggers have turned star quilt patterns into truly extraordinary designs. This quilt block pattern has plenty of gorgeous variations that you'll definitely want to try, especially if you enjoy working with AccuQuilt Go! dies. Another thing we didn't want to forget was that many of our readers are quilting on a budget, so we included the long-time favorite scrap quilt block, the "Scrappy Rainbow Star Quilt Block" (p. 14) to show just how eye-popping your patterns can be with the right mix of fabric scraps and leftover materials. This also introduces quilters to the well-known Lone Star pattern that you'll find in many other star quilt patterns. There's no better way to learn how to make one than with this easy quilting tutorial on piecework. Get your free copy of Spectacular Quilt Star Patterns: How to Make a Quilt with 8 Star Quilt Block Patterns and Quilted Star Designs for free today! Any eBook about star quilt patterns had better have some big ones! Spectacular Quilt Star Patterns: How to Make a Quilt with 8 Star Quilt Block Patterns and Quilted Star Designs wouldn't be complete without some full star quilt patterns that you can make into wall quilts, throws, and bed quilts. 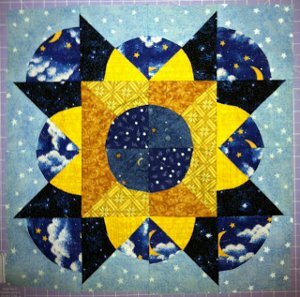 An always charming choice is the "Adaptable Star Quilt" (p. 32), which will give you plenty of guidance when it comes to making a star design that can be made into a series of quilt blocks in no time. These patterns are also excellent for around the house. Go for a quilt star design that's less conventional with the "Bed Time Wall Hanging" (p. 24), which uses a four pointed design that has an artistic appeal. You can also bring some color into a nursery for someone special with the vibrant "Friendship Star Baby Quilt" (p. 29), which makes the friendship star pattern all the more exciting with clever uses of a color palette. Any expecting mother will cherish such a fun pattern, and it's the perfect size for a crib or for use as a play mat. The biggest star quilt pattern in our eBook is one of our most popular free bed quilt patterns as well. The "My Blue Heaven Bed Quilt" (p. 37) is big and intricate, making it a favorite of intermediate level quilters. If you want to start setting aside more time to focus on a pattern, this is a great choice. You'll learn how to make two types of quilt block patterns that come together to create a truly impressive design that you'll be proud to display in your bedroom. It's got a slight vintage appeal, but can be easily be revamped to fit your own personal tastes with your choice of fabrics. Few patterns have remained as consistently popular as star quilt patterns, and these stellar patterns are ready to satisfy readers of all skill levels. You'll be able to make a pattern worthy of being called an all star with these 8 unique star designs. Once you have downloaded the eBook and subscribed to our Piecing It Together newsletter, you will receive new free quilt patterns in your e-mail inbox every week! Join the FaveQuilts.com quilting community and gain access to hundreds of free quilt patterns and connect with quilters all over the country. Download this free eBook and check out FaveQuilts.com for tons of quilting inspiration! These designs are gorgeous! I can't wait to try them. Thank you for all of the great patterns with easy to follow instructions. I am looking for the Ohio Star Pattern Please. Thank You SO much for the download...I've a novice quilter and have been looking for a star pattern with instructions....found it! !